According to the statistics loans for consumption (for general purposes – not home loans) by Irish consumers fell 8.4% year on year. Mortgage loans for home purchases fell 2.5% compared to the same time last year. Over the month household lending dropped by €632million, with a fall in the value of loans for consumptive purposes of €394million. 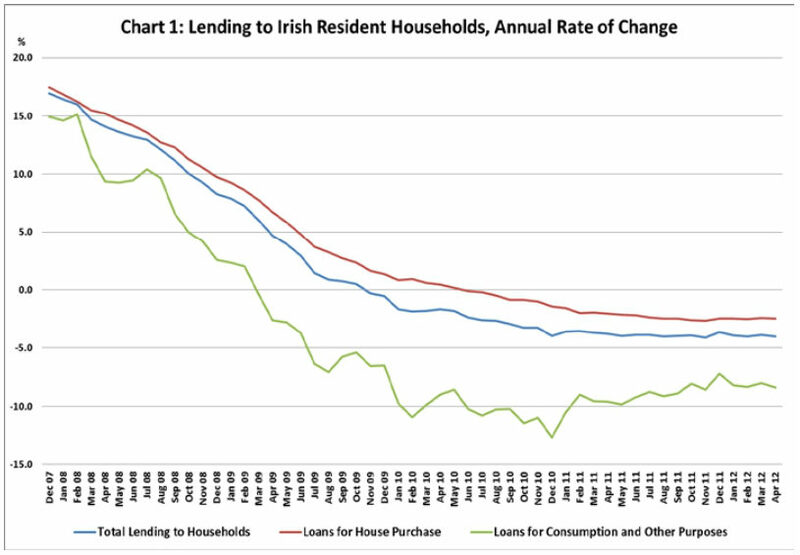 Loans overall were 4% lower on a year-on-year basis, continuing the fall of loans to Irish households that has steadily continued during 2012. The monthly net flow of loans to households averaged minus €385million in the three months ending April 2012, consisting of an aveage net flow of minus of €205million in loans for consumptive purposes. Irish resident private sector deposits were 3.4% lower on a yearly basis at the end of April 2012, compared with a decline of 4.3% over the year ending March. Deposits from households were 1.1% lower on a yearly basis in April. According to the Central Bank Money and Banking Statistics report there was a month-on-month increase of almost €4billion in Irish resident private-sector deposits during April. This apparently reflects developments in deposits from the OFI sector. You can read the Central Bank Money and Banking Statistics report here. Article by LoansIreland.ie. Information on loans and mortgages in Ireland.